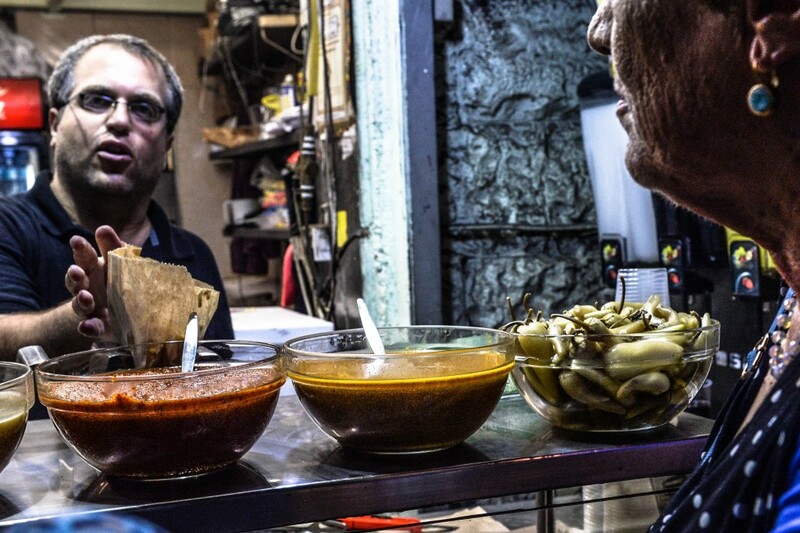 It’s the most important Israeli condiment you’ve never heard of. And it’s made from mangos. Hummus is quickly gaining popularity in America, with sales totaling about $800 million in 2012, nearly 50 times higher than 2006. As hummus skyrockets in popularity, fans of Middle Eastern food are rejoicing at its ubiquity. Years ago, the only place to enjoy hummus was at a Mediterranean restaurant, but today we can find it everywhere. However, there’s another Israeli product that has yet to make the jump from the Middle East to the United States, and that is amba. 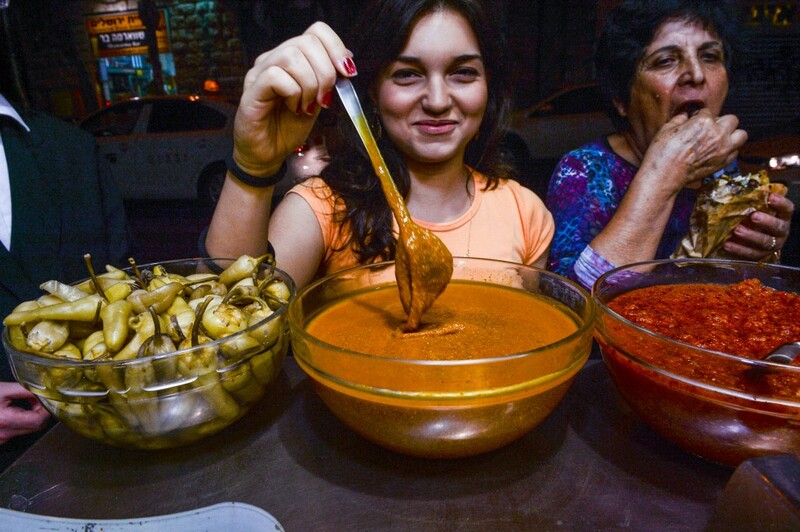 Amba is a spicy, sour mango condiment whose origins lie in an Iraqi version of an Indian food, and has now become a staple of Israeli street fare. While other Israeli foods, from hummus to falafel to shwarma, can be found in America, amba remains virtually unknown here, even to American Middle Easterners. In fact, I called over a dozen Mediterranean restaurants and specialty stores in the DC area, and only one carried amba—most had no idea what it was. My family had never heard of amba either, until we travelled to Israel several years ago. One night, we stopped for a late dinner at a shwarma stand in Tiberias. I noticed a squeeze bottle containing a dark yellow condiment. It wasn’t tahini, which is usually found in those bottles. So I asked about it. The guy behind the counter, exasperated at my apparent cultural ignorance, told me it was amba, an Iraqi mango sauce. I smelled it and was immediately skeptical of the “mango” claim. The scent was pungent and sharp, unlike anything I would remotely want to consume. But I tried it anyway. I squirted some on a corner of my shwarma and took a bite. Its sourness caught me off-guard. The taste reminded me as much of mangoes as ketchup does of tomatoes. While it’s difficult to buy amba in America, it’s relatively easy to find other ingredients of the popular “Mediterranean diet” — the set of grains, nuts, and vegetables that typifies the cuisines of Greece, Cyprus, and the Middle East. The Mediterranean diet is one of the healthiest in the world, but its American iteration lacks something that adds both health value and Middle Eastern authenticity: spiciness. World cuisines vary in terms of spiciness. Mexican, Ethiopian, and Indian fares are known for being very spicy, while British, Italian, and Mediterranean dishes are generally not. Mediterranean food contains a lot of herbs and spices, such as parsley, cumin, saffron, and za’atar — a blend of thyme, sumac, salt, and sesame seeds. But none of these have the spicy “pop” of curry or chili peppers. The two primary Mediterranean sauces — tahini and tzatziki — are fairly neutral. 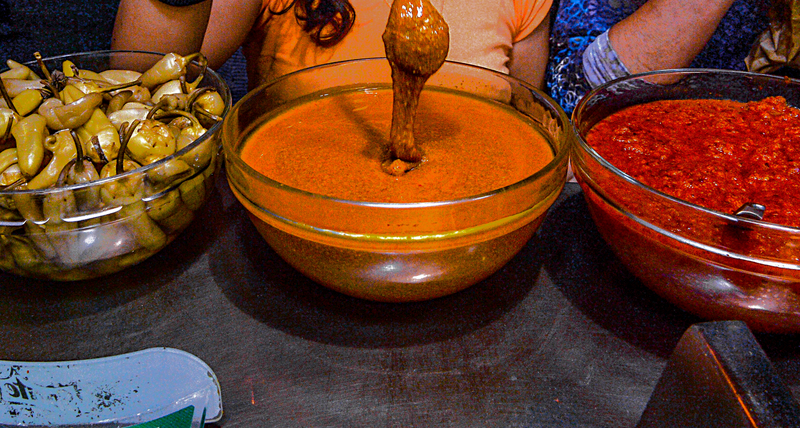 While amba is not mouth-burning hot, many recipes call for hot paprika or harissa, a North African chili pepper paste. Due to its spiciness, amba is fairly unique among Mediterranean foods, with health benefits other ingredients do not possess, and therefore would improve what Americans think of as the Mediterranean diet plan. In order to understand why Americans should consume amba as part of the Mediterranean diet, it’s important to understand how amba ended up becoming a Mediterranean food in the first place. Put simply, it was a result of Jews adapting to the British colonial economy. The British East India Company, a huge multinational trading firm founded in 1600, governed India from the 1750s to the 1850s. It also maintained a key port in Basra, Iraq. Through merchants’ connections, a cultural exchange began between Iraq and India. A community of Iraqi Jews ended up settling in India starting in the mid-1700s, peaking about a century later. They called themselves “Baghdadi Jews,” a title they use to this day, and were able to retain their Jewish identities while carving out a place for themselves in Indian society. The mango is native to India and pervasive in Indian cuisine, showing up in curries, yogurt beverages, and condiments called chutneys. “Chutney” is a very broad category: It can be prepared with just about any combination of fruits, vegetables, and spices, and mixed to almost any consistency. One of the more common preparations is mango chutney, which tends to be chunky and tangy. Through the Iraq-India exchange set up by Baghdadi Jews, mango chutney travelled to the Middle East, where it became amba. Amba is different than mango chutney; it’s creamier, spicier, and far more sour because it’s made from unripe pickled mangoes instead of fresh fruit. In his memoir Baghdad Yesterday, Iraq-born Israeli professor Sasson Somekh uses amba as the basis for an entire chapter. He tells the story of his early life growing up in Baghdad, surrounded by street vendors selling a diamond-shaped bread called sammoon that was filled with amba. He then narrates his move to Israel, where he finds that amba is sold in Iraqi communities. Somekh’s story is the story of an entire community. He was part of the mid-20th century Jewish exodus from Iraq, a migration that was swift, violent, and tragic. In June 1941, a brutal pogrom against the Jewish population of Baghdad broke out. This riot, known as the Farhud, killed at least 180 people, though the number is likely much higher, as many victims may have been buried in mass graves. Nearly a thousand people were injured, and hundreds of Jewish homes and businesses were destroyed. The situation worsened over the next few years. In 1947, the year before Israel was established, the Iraqi government prohibited immigration to Palestine. After Israel’s independence, Zionism became punishable by death. In 1951, the Israeli government stepped in, organizing Operation Ezra and Nehemiah, an airlift of Iraqi Jews to Israel. Despite the ban on immigration, the Iraqi government consented to this—reportedly, Iraqi Prime Minister Nuri al-Said was planning on expelling the Jews anyway—but required the Jews to sell their property, liquidate their businesses, and leave behind everything but 66 pounds of luggage and $140 per person. Within a month, 50,000 people signed up for Operation Ezra and Nehemiah, and the number of names on the list had nearly tripled two months later. In the end, 130,000 Iraqi Jews were brought to Israel, and most of the 6,000 who remained eventually immigrated as well. The Jewish Agency for Israel estimates that fewer than seven Jews remain in Iraq, and Israel’s Central Bureau of Statistics reports that there are approximately 230,000 Jews of Iraqi descent in Israel. When Iraqi Jews came to Israel, they brought their traditional foods with them, as Somekh noticed when he arrived. 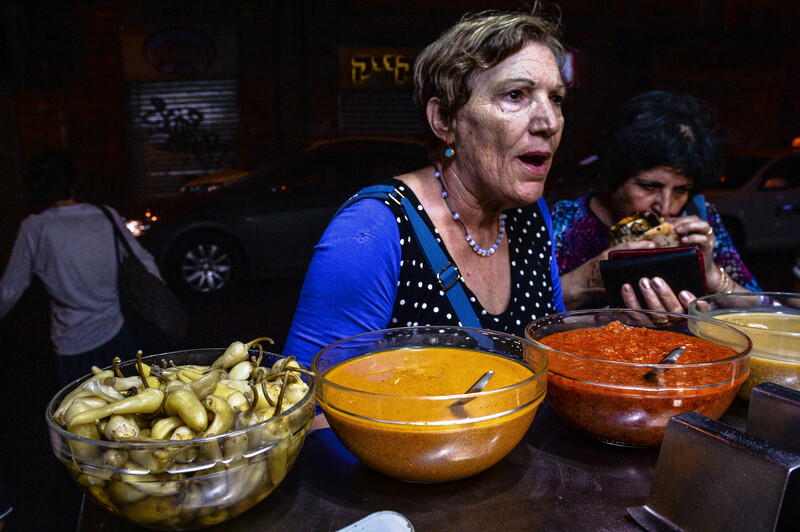 The two most notable Iraqi contributions to Israeli cuisine are sabich—a pita sandwich with fried eggplant, hard-boiled egg, and salad—and amba. As a result, amba has become a central feature of Israeli food. Yet amba remains largely unknown in the West, even as Middle Eastern food is becoming popular as part of the Mediterranean diet, one of the best eating plans in the world. The reason for the Mediterranean diet’s growing popularity is clear: Over the past few decades, America has become obsessed with diets of all kinds. The Boston Medical Center estimates that around 45 million Americans diet each year, spending an annual $33 billion on weight loss products. Yet nearly three-quarters of American adults are considered overweight or obese. So what’s wrong with American diets? One problem is that the common practice of cutting out specific food groups is not effective. 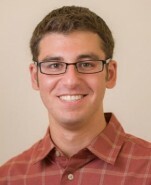 Physician and diet researcher Dr. David Katz and his Yale colleague Stephanie Meller conducted a study of six prominent diet plans. Some of the options under scrutiny required the removal or reduction of certain food groups, and others, like the Mediterranean and Paleo diets, called for carefully filtering out unacceptable individual foods. Their primary conclusion was that being selective about certain foods is more effective than eliminating them outright. The Mediterranean diet, they found, was the best of the six. While some diets attempt to cut out fat entirely, the typical Mediterranean diet is high in the specific types of fats the body needs. Some diets call for eating very few carbohydrates, but eating whole grains—which the Mediterranean diet includes—is more conducive to maintaining a healthy body weight than eating no grains at all. The Mediterranean diet also emphasizes fruits, vegetables, grains, legumes, and nuts. It generally calls for olive oil instead of butter, spices instead of salt, and fish and poultry instead of red meat. According to several studies conducted by the Mayo Clinic and the American Heart Association, the Mediterranean diet has been shown to reduce the risk of heart disease and cancer, as well as Parkinson’s and Alzheimer’s disease. Israel has put its own spin on the Mediterranean diet, and it outranks even its regional counterparts. A dietary study in the medical journal Lancet examined 187 countries worldwide, covering about 4.5 billion adults. Israel ranks ninth in the world in eating healthy foods, better than any other country in the Middle East. Eating eggs and dairy is also more common in Israel than the rest of the Mediterranean, and these additions make the Israeli diet healthier. While eggs are high in cholesterol, eating them does not normally raise “bad cholesterol” levels in most people. On the contrary, eggs can help increase “good cholesterol.” They also contain a wide variety of nutrients, such as protein. For its part, dairy is an important source of vitamin D and calcium. Israeli cuisine, then, is one of the healthiest forms of the Mediterranean diet, an already superior nutritional regimen. As good as the Mediterranean diet is, its health benefits can be improved even further by adding amba. There is a simple reason for this: Amba is spicy. There are many unique benefits of spicy foods. According to a National Institutes of Health study, people have a decreased desire for fatty, salty, and sweet foods during the 4.5 hours after eating spicy foods. These are the food groups that tend to contribute most to overeating. While this distinction is more pronounced among those who do not eat spicy foods regularly, a decrease in appetite was still observed among those who do. Another study, published in the behavioral nutrition journal Appetite, found that overeating and eating for pleasure generally decreased when subjects ate capsaicin, the molecule that produces spiciness. Consuming spicy foods, they found, increases the sense that one’s appetite is satiated. According to the Lancet study, however, countries with primarily spicy cuisines are not necessarily healthier overall than others. India comes in 70th out of the 187 countries on the list, Mexico falls below Israel, and Ethiopia is in the bottom five. While the incorporation of spiciness is beneficial, the rest of one’s diet is equally important. Because spicy foods predominantly appear in less healthy cuisines, a dieter would need to sacrifice the overall health of their meal in order to enjoy the benefits of authentic spicy foods. But by incorporating amba into the Mediterranean diet, the dieter would be able to obtain these benefits in a form that is consistent with the healthier aspects of the diet. Amba allows people to have the best of both worlds, and deserves an important place in the increasingly prevalent Mediterranean diet. At every Middle Eastern restaurant my mom and I go to, we ask for amba. But instead of amba, we are typically given a quizzical look: The server doesn’t even know what amba is. The only reason we know to ask for it is because we encountered it in Israel. Most Americans dining at Middle Eastern restaurants or adhering to the Mediterranean diet know nothing about it. This represents a stark difference between a genuine Mediterranean diet consumed in the Middle East, and the version followed by health-conscious Americans. Bringing the health benefits of amba to the American Mediterranean diet would not be difficult. Amba could easily follow in the footsteps of hummus, which for many years was disregarded by mainstream America as a niche food. Over the past five years, however, largely thanks to aggressive marketing of the Sabra brand, hummus sales have grown by 18 percent per year, which is about six times the growth of the overall American food market. All restaurants would have to do is to start making amba and offering it to customers. Gradually, it would gain a following, grow in popularity, and appear in grocery stores and the homes of dieters and average Americans. Once amba comes stateside, dieters will be better off, and my family will finally be able to enjoy a complete Middle Eastern meal.